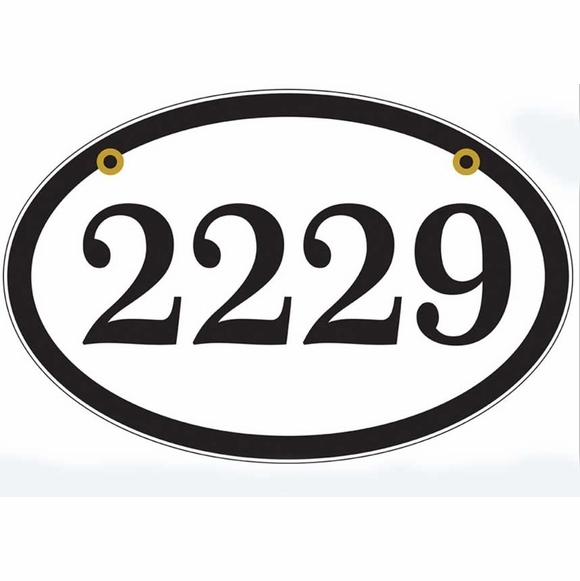 Two-Sided Hanging Reflective Address Plaque - - personalized one-line, double sided reflective address number plaque holds up to five large numbers or letters. Ready to hang from your bracket and post or one of ours. Made in USA. Fast turnaround; ships in 3-4 days. Reflective address signs, also known as 911 address signs, provide excellent visibility and help emergency responders find your home at times when even seconds matter. Two side hanging address sign can be seen from both sides of the road. Same numbers on front and back. Made from sturdy and UV-stabilized, non rusting, modified high impact acrylic. The leftmost small image shows two signs in darkness illuminated by a flashlight. The middle small image shows the same signs from 30 feet away at night as they are hit by car headlights. The rightmost small image shows a standard black and white oval sign and a reflective oval in daylight. Reflective address signs, also known as 911 address signs, provide excellent visibility and help emergency responders find your home when every second counts.